The church fills with a wild, joyous, celebratory music that vibrates the pews. At the organ console, Marc Longlois leans into the keyboard, his feet dancing on the pedals as he plays Jehan Alain's "Litanies." He plays a pipe organ from Aeolian-Skinner Co. of Boston, known as Opus 1304, which was put into service almost half a century ago at the First United Methodist Church in Riverside. "It was quite a prestigious company. It was like the Rolls-Royce of organ builders," said church organist Longlois, who also teaches in the theater department at UC Riverside. After undergoing a four-month, $70,000 renovation, Opus 1304 will be rededicated Sunday with a concert featuring works by Bach, Franck and more. Aeolian-Skinner, in operation from about 1901 to 1971, was a pioneer in symphonic organs. Historians consider these organs significant enough to keep track of their opus numbers. Longlois said the months-long separation was difficult for him. He accompanied the congregation on a piano -- not at all the same experience. He is so enamored of pipe organs he passed up a possible move to work in the theater department of Cal State Fresno when he learned there were no organs there. 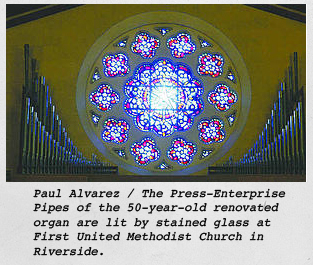 Towns in the Inland area, such as Riverside and Redlands, have a number of pipe organs purchased by church congregations. "It's one of the most exciting instruments you could ever play. It's completely physical. You play with your hands and your feet," Longlois said. "It can be a little baby or a giant roaring thing." The renovated organ is valued at $1.5 million. It's got more agility and a richer sound than before. It now has 3,128 pipes in 56 ranks (rows of pipes in one tone color) and 47 stops (knobs that turn ranks on and off). The previous upgrade in 1967 had put the organ at 2,967 pipes. "An excellent organ will have wonderful balance among the ranks," said Steuart Goodwin, a notable organ builder and pipe voicer whose San Bernardino-based business works throughout the country. He spent two years traveling to Salt Lake City to revoice the Mormon Tabernacle Aeolian-Skinner organ. "We go through the entire organ and regulate to get even tone quality and get beautiful sound from each pipe," Goodwin said. "The results are variable and complex. Every organ is different." Goodwin adjusted Opus 1304's pipes to ensure that air flows in the right amount and direction. He said his tonal work is an organ's finishing touch to be sure the parts work the way they should. "An American classic organ such as this one is supposed to play all sorts of music, and a lot don't because their tone qualities are off," said Goodwin, a Riverside native who had attended the church. A graduate of the University of Redlands, he received a Fulbright grant to study organ building in the Netherlands and is on the governing board of the Orange County Theatre Organ Society. On this project, he worked with Longlois, because organists know an instrument's strengths and weaknesses, and with Ryan Ballantyne, who maintains -- tuning and rebuilding -- more than 80 pipe organs in Southern California. Ballantyne is an apprentice to Manuel Rosales, who worked on the Walt Disney Concert Hall organ. "Pipe organs last forever as long as they are taken care of," Ballantyne said. "This is a living instrument." As part of the renovation of Opus 1304, some pipes were cleaned and restored, some replaced and some added. Among additions were open flute sounds and reed sounds. "It gives the organ more flexibility to play different periods of music," Ballantyne said. "And the overall sound is higher-quality with those added parts." New stops and knobs were added to the console to support the new pipes. Old keys were replaced. The innards of the organ console were once filled with an electro-pneumatic machine that was wearing out. The mechanism used magnets to produce a memory when the organist set a combination or group of stops to get a specific sound. Now that space is empty except for some computer circuit boards installed by Ballantyne. But the organ hasn't lost its soul and gone electronic. It still is played by air being pushed through the thousands of pipes, which range from the size of pencil to a 16-foot-tall contrabass. However, the memory is now digital, offering new options to the organist. "The point of adding things is we can have better sounds and a variety of sounds, and the organ becomes more diverse," Ballantyne said. "Whenever there's a concert, that's the payoff." Longlois will play for both the morning service Sunday and for the afternoon concert where he will be joined by Dorothy Hester, 90, church organist from 1960 to 1977, and David Christensen, who served from 1977 until 1984 and is the UCR carillonneur. Copyright © 2007 R.M. Ballantyne Pipe Organs All rights reserved.